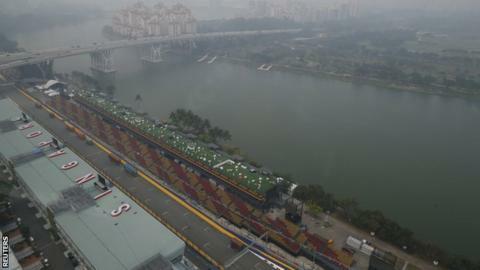 There are no plans to amend the racing programme for the Singapore Grand Prix, event organisers have announced. A cloud of haze caused by farmers in neighbouring Indonesia has been hanging over the city state. "It is currently not possible to reliably predict what the pollution level might be as it changes hour to hour," said a statement. The haze level was rated as 'unhealthy' at 17:00 BST on Tuesday, a drop from 'very unhealthy' levels on Monday. Singapore is often shrouded by haze at this time of year owing to forests being burned to clear land for agriculture. Race organisers said on Tuesday they would make masks available at cost price for people attending the race, while medical and first aid posts are on standby to deal with any haze-related conditions. The statement added that organisers will "work closely with all the relevant government authorities to receive the best possible forecasts when they are available". "For many years, the annual smog has been at the centre of heated diplomatic debate between Indonesia and Singapore. Some citizens of both countries have launched online campaigns to combat the haze." A number of local sports events in Singapore were cancelled last weekend due to health concerns. Haze concerns are nothing new to F1, with the Chinese Grand Prix in Shanghai routinely affected by concerns over air quality. In 2013, the final practice session for the Indian Grand Prix was delayed by 20 minutes due to pollution causing such poor visibility it meant the medical helicopter was unable to take off. The floodlit night race around Singapore's Marina Bay street circuit is the 13th round of the 2015 season. World champion Lewis Hamilton goes into the race with a commanding 53-point lead over Mercedes team-mate Nico Rosberg in the drivers' standings.